PROPHET - DATE JONAH (825 -785 BC)? JOEL (800 BC)? HOSEA (785 -725 BC)? MICAH (785 -710 BC)? AMOS (784 BC)? ISAIAH (701 -681 BC)? NAHUM (700 BC)? ZEPHANIAH (630 BC)? JEREMIAH (629 -588 BC)? DANIEL (606 -534 BC)? HABAKKUK (598 BC)? EZEKIEL (597 -573 BC)? OBADIAH (588 -562 BC)? EZRA (536 -456 BC)? HAGGAI(532 -512 BC)? ZECHARIAH (520 -475 BC)? NEHEMIAH (465 -424 BC)? MALACHI (420 -397 BC)? KING / EVENT - DATE TIGLATH-PILESER (745 -727 BC)? HEZEKIAH (JUDAH) (726 -698 BC)? SHALMANESER (727 -722 BC)? ISRAEL TAKEN CAPTIVE (722 BC)? SENNACHERIB (705 -681 BC)? NEBUCHADNEZZAR (605 -562 BC)? ZEDEKIAH (JUDAH) (597 -586 BC)? 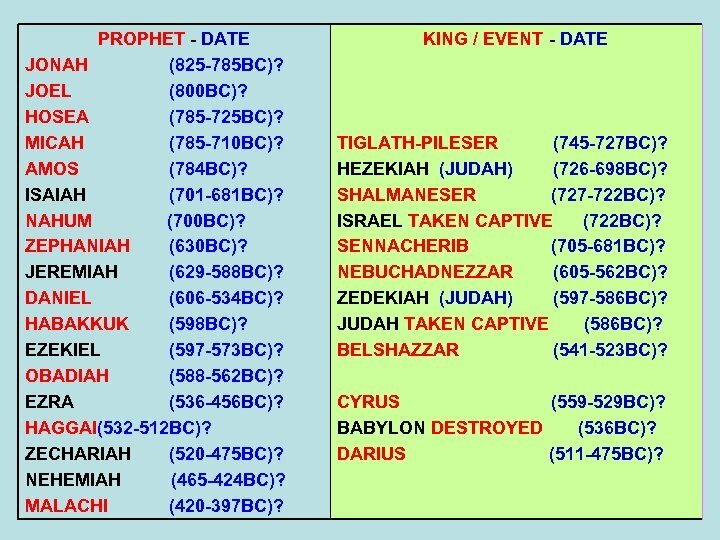 JUDAH TAKEN CAPTIVE (586 BC)? BELSHAZZAR (541 -523 BC)? CYRUS (559 -529 BC)? BABYLON DESTROYED (536 BC)? DARIUS (511 -475 BC)? 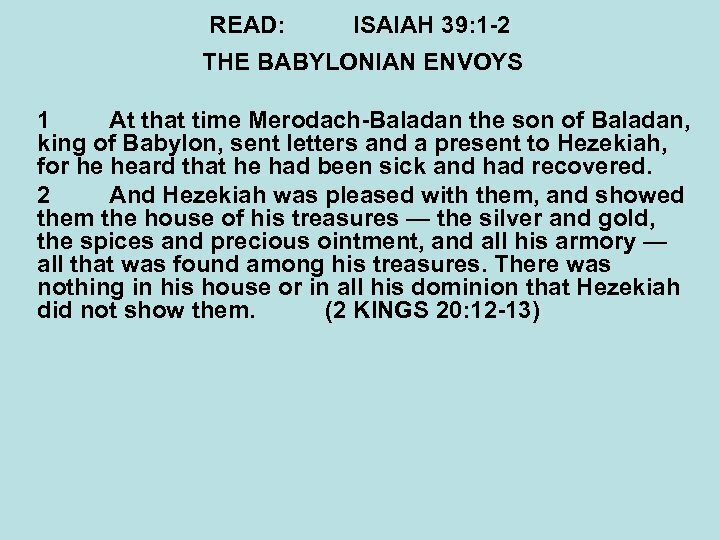 READ: ISAIAH 39: 1 -8 ISAIAH 39: 1 SAME AS 2 KINGS 20: 12 -19 THE BABYLONIAN ENVOYS 1 At that time Merodach-Baladan the son of Baladan, king of Babylon, sent letters and a present to Hezekiah, for he heard that he had been sick and had recovered. 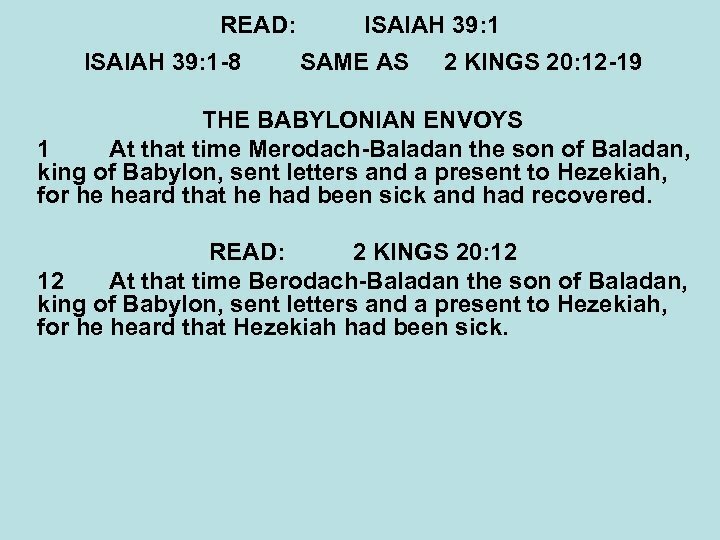 READ: 2 KINGS 20: 12 12 At that time Berodach-Baladan the son of Baladan, king of Babylon, sent letters and a present to Hezekiah, for he heard that Hezekiah had been sick. READ: ISAIAH 39: 2 2 And Hezekiah was pleased with them, and showed them the house of his treasures — the silver and gold, the spices and precious ointment, and all his armory — all that was found among his treasures. There was nothing in his house or in all his dominion that Hezekiah did not show them. READ: 2 KINGS 20: 13 13 And Hezekiah was attentive to them, and showed them all the house of his treasures — the silver and gold, the spices and precious ointment, and all his armory — all that was found among his treasures. There was nothing in his house or in all his dominion that Hezekiah did not show them. 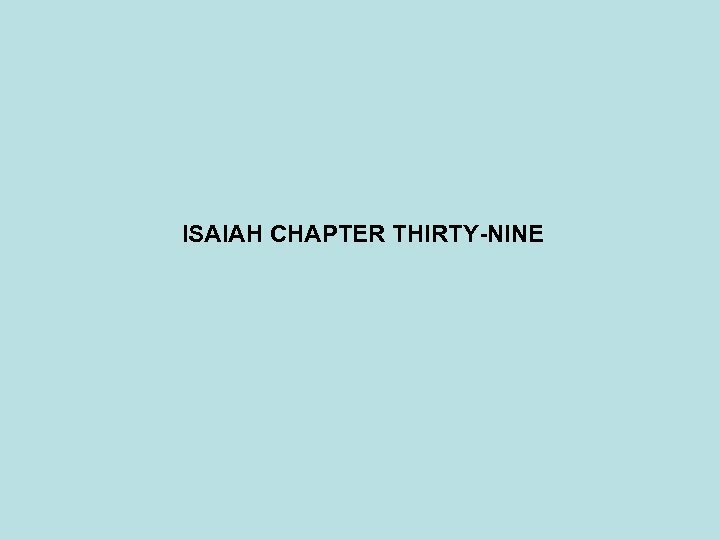 READ: ISAIAH 39: 3 -4 3 Then Isaiah the prophet went to King Hezekiah, and said to him, "What did these men say, and from where did they come to you? “ So Hezekiah said, "They came to me from a far country, from Babylon. " 4 And he said, "What have they seen in your house? “ So Hezekiah answered, "They have seen all that is in my house; there is nothing among my treasures that I have not shown them. " READ: 2 KINGS 20: 14 -15 14 Then Isaiah the prophet went to King Hezekiah, and said to him, "What did these men say, and from where did they come to you? “ So Hezekiah said, "They came from a far country, from Babylon. " 15 And he said, "What have they seen in your house? “ So Hezekiah answered, "They have seen all that is in my house; there is nothing among my treasures that I have not shown them. " 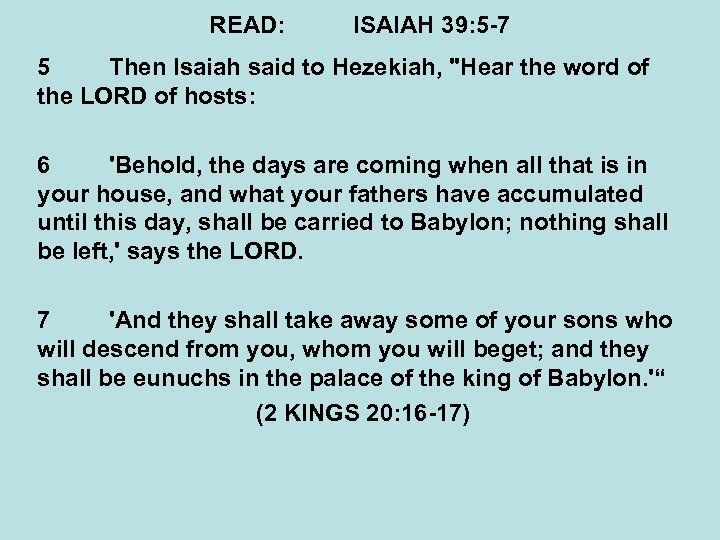 READ: ISAIAH 39: 5 -6 5 Then Isaiah said to Hezekiah, "Hear the word of the LORD of hosts: 6 ‘Behold, the days are coming when all that is in your house, and what your fathers have accumulated until this day, shall be carried to Babylon; nothing shall be left, ' says the LORD. 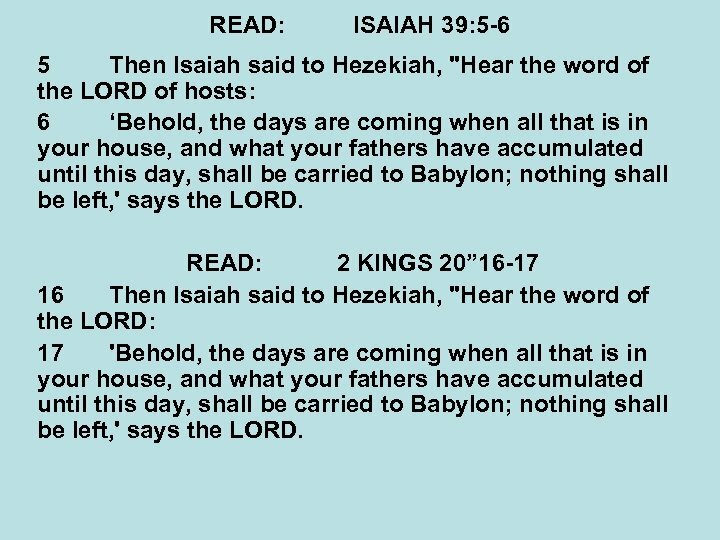 READ: 2 KINGS 20” 16 -17 16 Then Isaiah said to Hezekiah, "Hear the word of the LORD: 17 'Behold, the days are coming when all that is in your house, and what your fathers have accumulated until this day, shall be carried to Babylon; nothing shall be left, ' says the LORD. 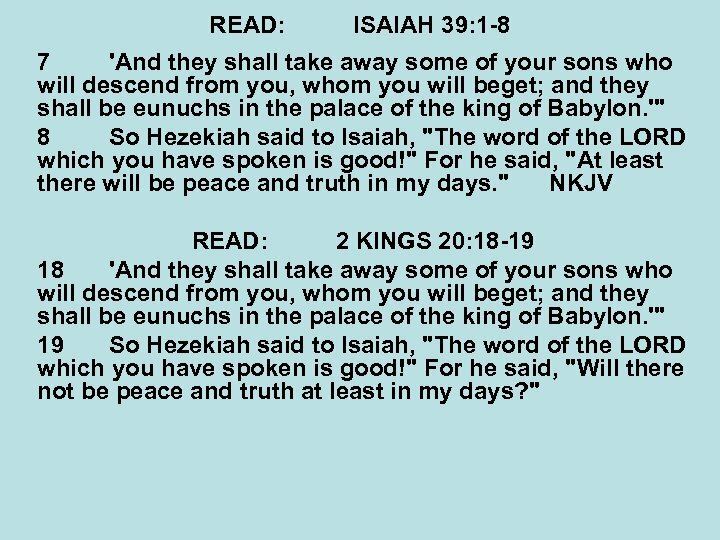 READ: ISAIAH 39: 1 -8 7 'And they shall take away some of your sons who will descend from you, whom you will beget; and they shall be eunuchs in the palace of the king of Babylon. '" 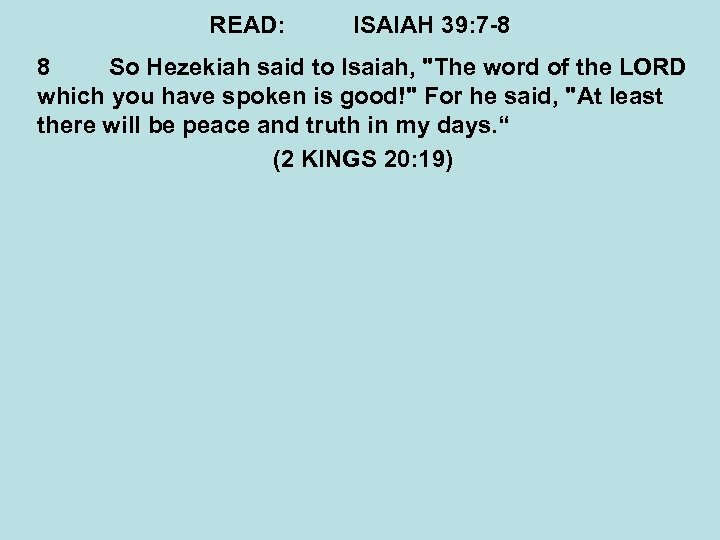 8 So Hezekiah said to Isaiah, "The word of the LORD which you have spoken is good!" For he said, "At least there will be peace and truth in my days. " 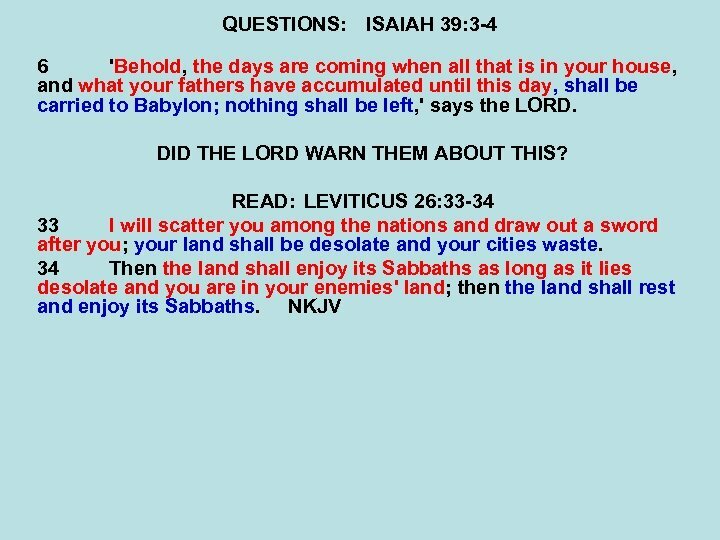 NKJV READ: 2 KINGS 20: 18 -19 18 'And they shall take away some of your sons who will descend from you, whom you will beget; and they shall be eunuchs in the palace of the king of Babylon. '" 19 So Hezekiah said to Isaiah, "The word of the LORD which you have spoken is good!" For he said, "Will there not be peace and truth at least in my days? " 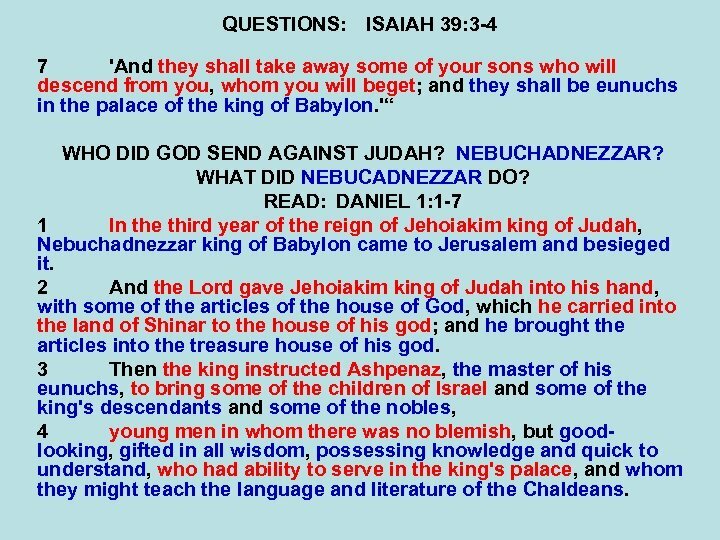 QUESTIONS: ISAIAH 39: 1 -2 1 At that time Merodach-Baladan the son of Baladan, king of Babylon, sent letters and a present to Hezekiah, for he heard that he had been sick and had recovered. 2 And Hezekiah was pleased with them, and showed them the house of his treasures — the silver and gold, the spices and precious ointment, and all his armory — all that was found among his treasures. There was nothing in his house or in all his dominion that Hezekiah did not show them. 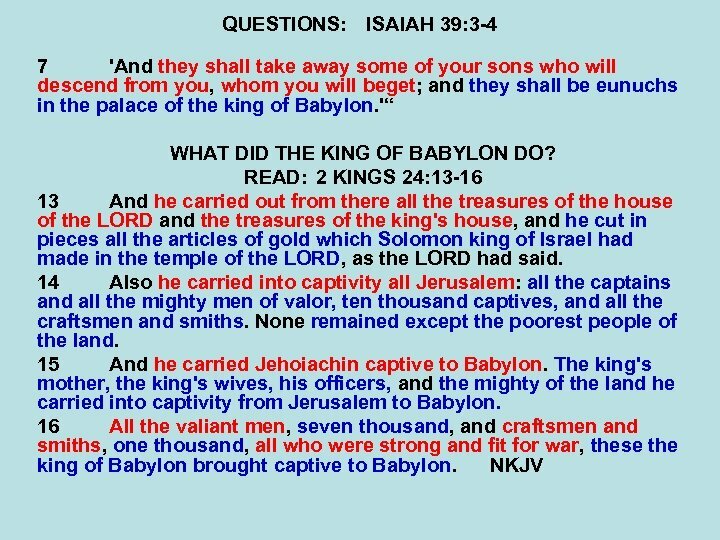 (2 KINGS 20: 12 -13) WHO WAS THIS KING OF BABYLON? MEDORACH – MEDARECH - MEDURACH HOW DID HEZEKIAH RECEIVE THEM? WHAT DID HEZEKIAH DO? WHY? QUESTIONS: ISAIAH 39: 1 -2 2 And Hezekiah was pleased with them, and showed them the house of his treasures — the silver and gold, the spices and precious ointment, and all his armory — all that was found among his treasures. There was nothing in his house or in all his dominion that Hezekiah did not show them. 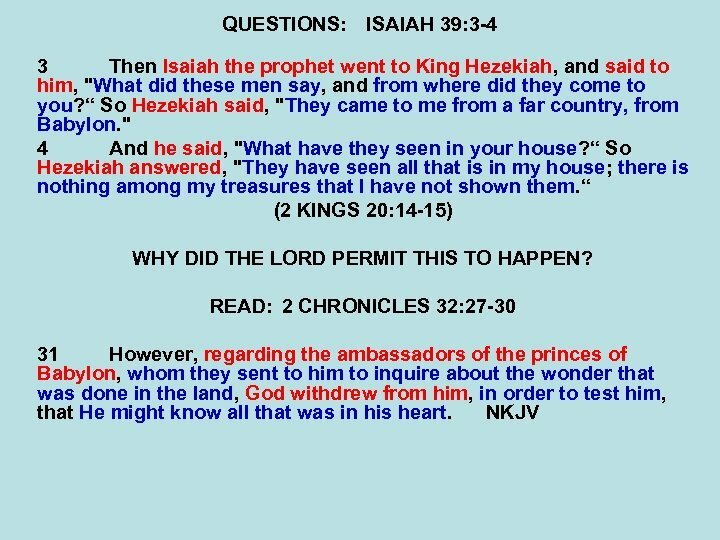 (2 KINGS 20: 12 -13) WHY DID THE LORD BLESS HEZEKIAH & JUDAH? READ: 2 CHRONICLES 32: 22 -23 22 Thus the LORD saved Hezekiah and the inhabitants of Jerusalem from the hand of Sennacherib the king of Assyria, and from the hand of all others, and guided them on every side. 23 And many brought gifts to the LORD at Jerusalem, and presents to Hezekiah king of Judah, so that he was exalted in the sight of all nations thereafter. QUESTIONS: ISAIAH 39: 1 -2 2 And Hezekiah was pleased with them, and showed them the house of his treasures — the silver and gold, the spices and precious ointment, and all his armory — all that was found among his treasures. There was nothing in his house or in all his dominion that Hezekiah did not show them. 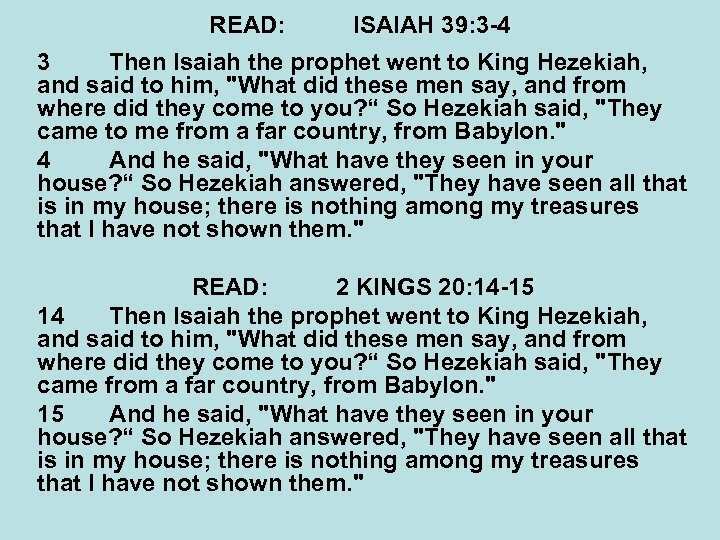 (2 KINGS 20: 12 -13) WHAT WAS THE EXTENT OF HEZEKIAH’S WEALTH? READ: 2 CHRONICLES 32: 27 -30 27 Hezekiah had very great riches and honor. And he made himself treasuries for silver, for gold, for precious stones, for spices, for shields, and for all kinds of desirable items; 28 storehouses for the harvest of grain, wine, and oil; and stalls for all kinds of livestock, and folds for flocks. 29 Moreover he provided cities for himself, and possessions of flocks and herds in abundance; for God had given him very much property. 30 This same Hezekiah also stopped the water outlet of Upper Gihon, and brought the water by tunnel to the west side of the City of David. Hezekiah prospered in all his works. QUESTIONS: ISAIAH 39: 1 -2 1 At that time Merodach-Baladan the son of Baladan, king of Babylon, sent letters and a present to Hezekiah, for he heard that he had been sick and had recovered. 2 And Hezekiah was pleased with them, and showed them the house of his treasures — the silver and gold, the spices and precious ointment, and all his armory — all that was found among his treasures. There was nothing in his house or in all his dominion that Hezekiah did not show them. (2 KINGS 20: 12 -13) WHAT DID MERODACH KING OF BABYLON DO? HOW DID HEZEKIAH RECEIVE THE MESSENGERS? WHY DID THE LORD PERMIT THIS TO HAPPEN? QUESTIONS: ISAIAH 39: 3 -4 3 Then Isaiah the prophet went to King Hezekiah, and said to him, "What did these men say, and from where did they come to you? “ So Hezekiah said, "They came to me from a far country, from Babylon. " 4 And he said, "What have they seen in your house? “ So Hezekiah answered, "They have seen all that is in my house; there is nothing among my treasures that I have not shown them. “ (2 KINGS 20: 14 -15) WHAT DID ISAIAH ASK HEZEKIAH? HOW DID HEZEKIAH RESPOND? 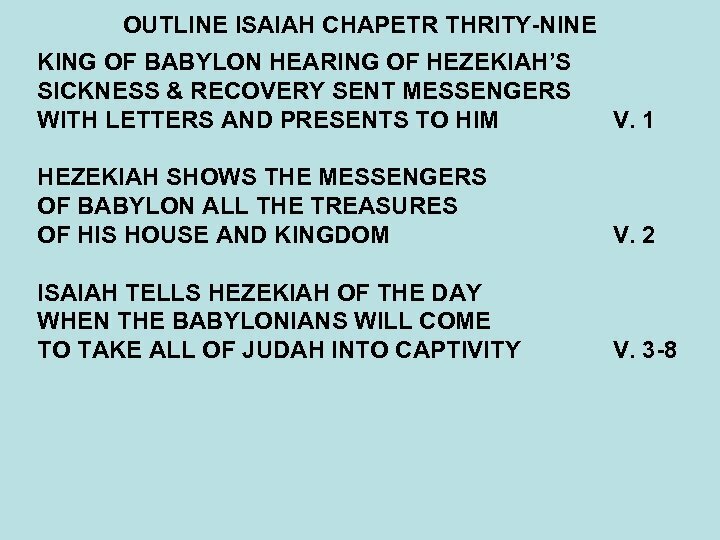 WHAT DID HEZEKIAH REVEAL TO THE BABYLONIANS? 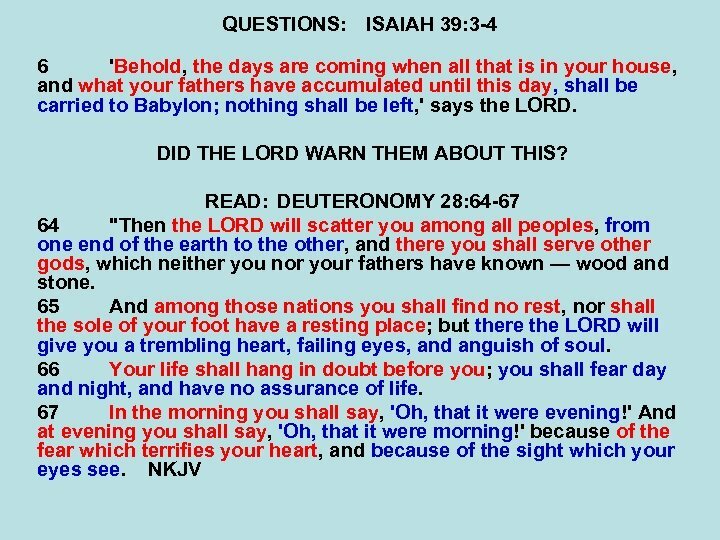 QUESTIONS: ISAIAH 39: 5 -7 5 Then Isaiah said to Hezekiah, "Hear the word of the LORD of hosts: 6 'Behold, the days are coming when all that is in your house, and what your fathers have accumulated until this day, shall be carried to Babylon; nothing shall be left, ' says the LORD. 7 'And they shall take away some of your sons who will descend from you, whom you will beget; and they shall be eunuchs in the palace of the king of Babylon. 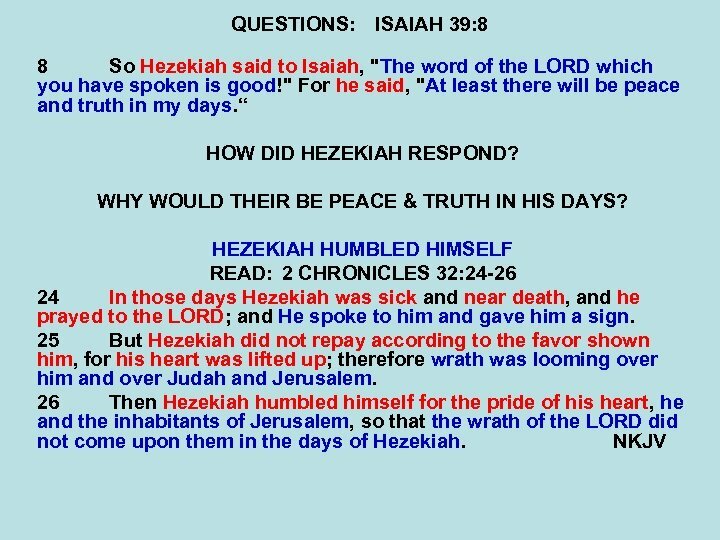 '“ (2 KINGS 20: 16 -17) WHAT DID THE LORD SAY TO HEZEKIAH? 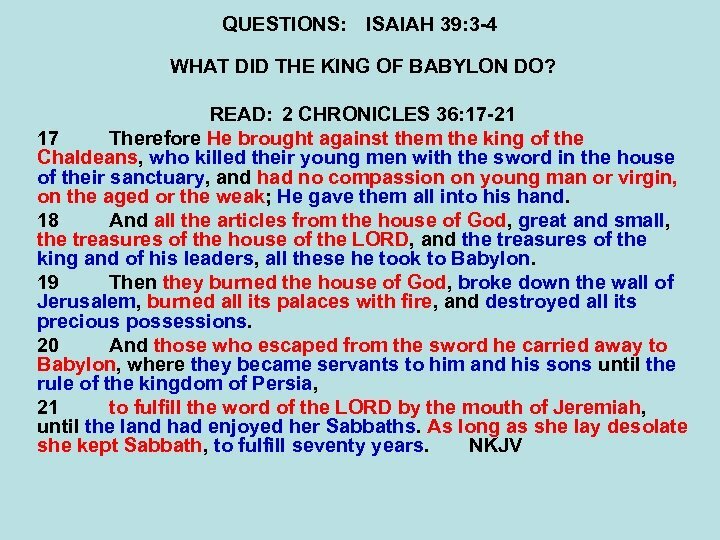 WHAT WOULD THE KINGS OF BABYLON DO? DID THE LORD WARN THEM ABOUT THIS? 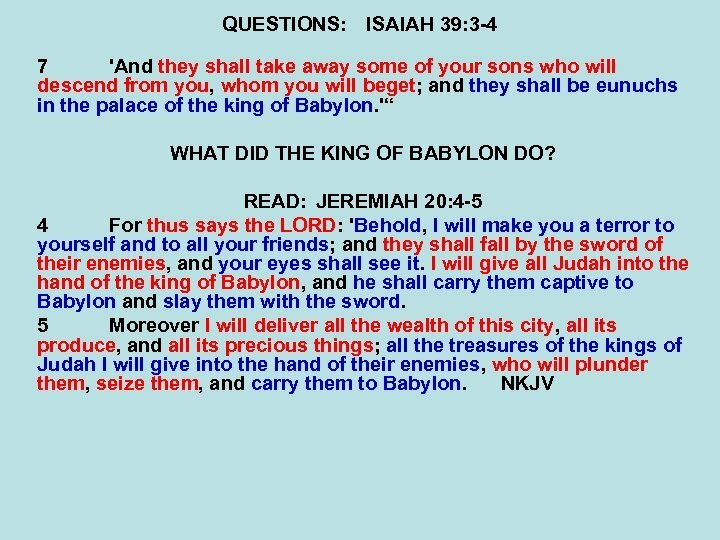 QUESTIONS: ISAIAH 39: 3 -4 7 'And they shall take away some of your sons who will descend from you, whom you will beget; and they shall be eunuchs in the palace of the king of Babylon. '“ WHO DID GOD SEND AGAINST JUDAH? NEBUCHADNEZZAR? WHAT DID NEBUCADNEZZAR DO? READ: DANIEL 1: 1 -7 1 In the third year of the reign of Jehoiakim king of Judah, Nebuchadnezzar king of Babylon came to Jerusalem and besieged it. 2 And the Lord gave Jehoiakim king of Judah into his hand, with some of the articles of the house of God, which he carried into the land of Shinar to the house of his god; and he brought the articles into the treasure house of his god. 3 Then the king instructed Ashpenaz, the master of his eunuchs, to bring some of the children of Israel and some of the king's descendants and some of the nobles, 4 young men in whom there was no blemish, but goodlooking, gifted in all wisdom, possessing knowledge and quick to understand, who had ability to serve in the king's palace, and whom they might teach the language and literature of the Chaldeans. 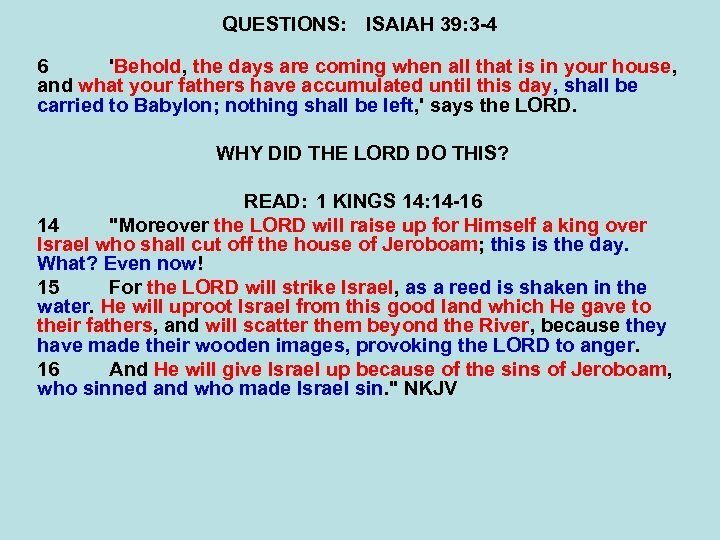 QUESTIONS: ISAIAH 39: 3 -4 7 'And they shall take away some of your sons who will descend from you, whom you will beget; and they shall be eunuchs in the palace of the king of Babylon. '“ WHAT AUTHORITY DID NEBUCHADNEZZAR GIVE THE EUNUCHS? WHO WERE SOME OF THESE EUNUCHS? 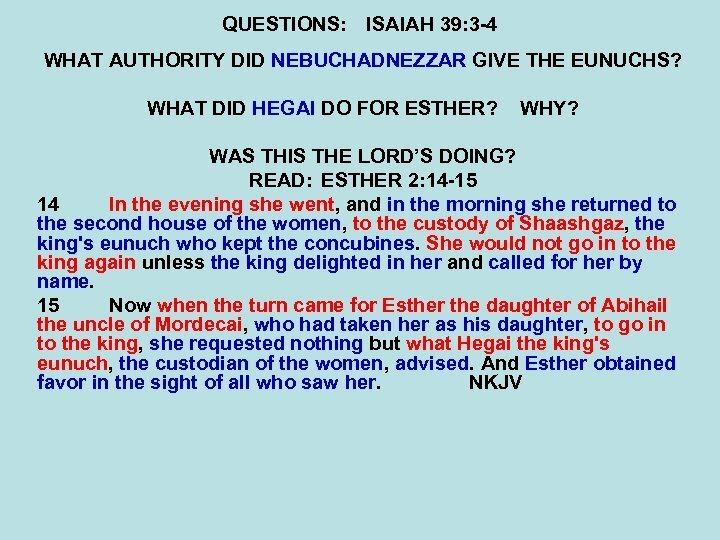 READ: ESTHER 1: 10 -12 10 On the seventh day, when the heart of the king was merry with wine, he commanded Mehuman, Biztha, Harbona, Bigtha, Abagtha, Zethar, and Carcas, seven eunuchs who served in the presence of King Ahasuerus, 11 to bring Queen Vashti before the king, wearing her royal crown, in order to show her beauty to the people and the officials, for she was beautiful to behold. 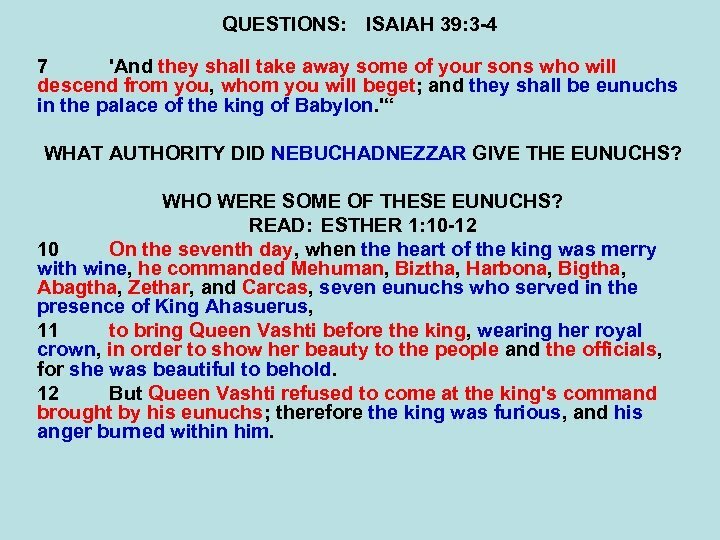 12 But Queen Vashti refused to come at the king's command brought by his eunuchs; therefore the king was furious, and his anger burned within him.